Made by Sharp Corporation in Australia, Oceania, 1984. Colour printed portrait format poster advertising the Sharp GF-7700 portable stereo cassette player. This posters features the slogan "Sharp Unleashes your Sound!" across the upper edge of the poster with an image of the cassette player superimposed over the Sharp rainbow logo across the bottom right of the poster. 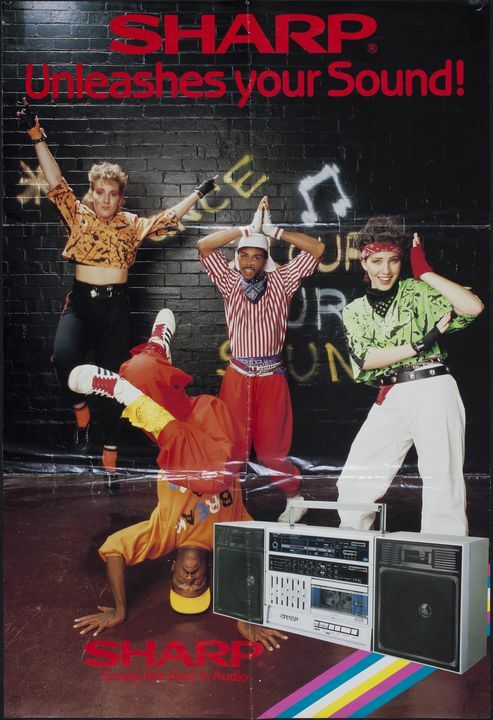 The main image depicts four hip hop dancers posed in front of a black painted wall spray painted with slogans. The dancers are: Darrio Phillips posed centre front on his head; Michael McGuirt posed with his arms above his head; and Julia and Daniella Finkenauer posed on either side. This advertising poster was produced for the portable stereo cassette player Sharp GF-7700, which was released in Australia in 1984. The four dancers posed in front of a mock wall in a photographic studio which was painted to appear as a graffitti wall. The photographic style of this poster is typical of techniques used in poster production in Australia in the 1980s. The donor Darrio Phillips was a breaker (street dancer) in Sydney in the 1980s. He, along with dancers Michael McGuirk and the sisters Julia and Daniella Finkenauer were approached in 1984 to appear in this poster advertising the Sharp GF-7700. The 1984 break dancing themed film, 'Breakin', released in Australia as 'Breakdance: The Movie' was one of a number of films released in the early 1980s that popularised Hip Hop culture, bringing it to a mainstream audience. Darrio Phillips recalled that in the Sydney Hip Hop scene at the time he and other break dancers wore completely different clothing. "Nobody wore that stuff but because of the movie they made them wear that stuff". They were specifically asked to wear clothing that imitated the style of clothing worn in the film 'Breakdance: The Movie'. The poster was given to the donor by a shop that sold Panasonic products. The poster formed part of the display for Hip Hop subculture in the Powerhouse Museum exhibition 'The 80s are Back', 2009-2011. The street dancer Darrio Phillips (Frank Phillips), originally from Ohio, United States of America, moved to Australia in 1981. He is recognised in the Australian Hip Hop community as being a pioneer and one of the original street dancers (or break dancers) to spread this style in Sydney and Australia. Phillips took the name Darrio from a Kid Creole and the Coconuts song: 'Darrio can you get me into Studio 54'. He was introduced to rap music through the music of seminal American Hip Hop group, Run-D.M.C. Initially he listened to rap music to learn the street patois of the American sailors he met in Sydney. Phillips recalled "damnit I'm American and I can't understand what they're saying. So I listened to rap music so I could understand what was going on". He liked dressing up and found the more he dressed up the better he was treated and in so doing created a new persona for himself. Phillips met Daryl Von Bok in Sydney and taught him the street dance moves he knew. They formed the street dance duo the 'Double D's' (1982-1988). Their dress style was inspired by clothes from 1940s movies, the band 'Kid Creole and the Coconuts' and later the film 'Breakdance: The Movie'. They favoured loose fitting suits, wide ties, two tone shoes, braces and hats. Phillips liked the dissonance of mixing this smart look with street dancing and was inspired by Michael Jackson. The Double D's were one of the first professional street dance performers in Sydney, The United Break Team were the only other professional street dance group working in Sydney at the time. The Double D's worked five nights a week at Kinselas nightclub in Taylor Square, appearing after the comedian Max Gillies. They were invited to appear on tv personality, Daryl Summers' variety show in a 'Guys dance better than girls' segment, their first television appearance. This appearance gave them much exposure which generated constant work in nightclubs and television shows as well as the opening slot on the Australian tour of the band KC and the Sunshine Band. Television appearances included appearing in a Michael Jackson 'Thriller' tribute on the Daryl Summers' show, in a 'Flashdance' style competition on Countdown, Star Search, Good Morning Australia and the Ray Martin Show. Simon Townsend's Wonder World did a segment on their clothing style, filmed in their apartment in Guildford. They also appeared in the video for the song 'Gotta be Wrong (way to love)' by the Sydney band the Dynamic Hepnotics, filmed in the Enmore Theatre in Sydney in 1985. Sydney youth were keen to learn the routines the Double D's performed. In the early 1980s there was little 'rap music' officially available in Australian record stores. Most music was taped from the radio and played on Ghetto Blasters (portable stereo cassette players). Dance moves were initially copied from video clips seen on television and in films like 'Beat Street' and 'Breakdance: The Movie'. Phillips and Von Bok taped their television performances and sold the tapes as teaching tools. They also taught their routines in a dance studio above Rap City record store. "I'd go to clubs and people would come up to me and say I've got a tape of yours. I paid 20 bucks for it!" One of the earliest teachers and choreographers of street dance in Sydney in the 1990s, to both professionals and amateurs, Darrio Phillips continues to teach. At the vanguard of new dance styles, he has embraced KRUMP, a style that emerged from the ghettoes of Los Angeles, USA. He runs workshops, competitions and works with many disenfranchised and community groups teaching this style as well as other Hip Hop styles. He continues to be an adjudicator at many Hip Hop and street dance events across Australia. Interviews with Darrio Phillips, May 2009, April 2013. Interview with Rosano Martinez, June 2009.